Editable royalty-free map of Bahrain in vector-graphic online store. Territorial Seas: 26 NM in a contiguous zone, territorial seas of 12 NM. continental shelf boundaries have yet to be determined. Bahrain’s six inhabited islands—Bahrain, Al Muharraq, Sitrah, Umm an-Na''san, Nabih Salih, and Jidda—and their position in an inlet of the Persian Gulf have given this multi-island nation a regional importance as a trade and transportation center. The low rolling hills, rocky cliffs, and wadis comprise the majority of this barren land, although along the north coast of the island of Bahrain is a narrow strip of land that is irrigated by natural springs and artesian wells. Most of the lesser islands are flat and sandy, although date groves cover the island of Nabih Salih. 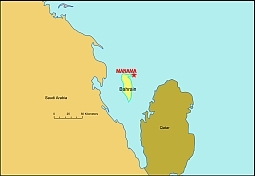 Bahrain also possesses the Hawar Islands, off the coast of Qatar. Located in an inlet of the Persian Gulf, the Gulf of Bahrain, the island of Bahrain is connected to other major islands by bridges, and to Saudi Arabia by the King Fahd Causeway. The country is comprised of 33 islands, the 6 major islands being: Bahrain, the largest; Al Muharraq; Sitrah; Umm an-Na''san; Nabih Salih; and Jidda. In 2001 the International Court of Justice awarded the Hawar Islands, long disputed with Qatar, to Bahrain. The remaining islands are little more than exposed rock and sandbar. Unfortunately, coastal degradation (damage to coral reefs and sea vegetation) resulting from oil spills and other discharges from large tankers, oil refineries, and distribution stations has adversely affected Bahrain’s coastline and beaches. Summers are very hot and humid with southwest winds raising dust storms and drought conditions. Winters are mild, cool, and pleasant. Average temperatures in July range from 84°F (29°C) to 79°F (37°C)| and in January from 68°F (20°C) to 57°F (14°C). Prevailing southwest winds that sweep this low-lying desert plain contribute to dust storms and occasional drought. Rainfall averages less than 4 in (10 cm) annually and occurs primarily from December to March. Due to its location and weather patterns, the State of Bahrain is primarily desert, with only a narrow strip of land on the main island that is irrigated by natural springs and artesian wells. Bahrain depends on the exploitation of oil, natural gas, fish, and pearls to support its economy. There is little arable land and no forests.